If it wasn’t already obvious from the promotional copy on their website, PROJECT Trio’s version of Charles Mingus’ “Fables of Faubus,” their set opener at the second Harker Concert Series event of the season, drove the point home. For them, chamber music is the province of the classicists with season tickets to the local symphony, the vinyl hunters keeping brick-and-mortar record stores afloat, the knit cap-wearing cafe denizens, the college-aged millennials combing the depths of Bandcamp well into the night and every type of enthusiast in between. They reach for the most improbable of goals: To be adventurous, true to themselves and inclusive all at the same time. And they have a ton of fun doing it. Best known for the percussive “beatbox flute” style of Greg Pattillo, whose videos have been viewed tens of millions of times, PROJECT Trio is as lively as any jazz combo. With their constant swaying, stomping and an eclectic range of influences, it would be easy for a new listener to call them one, were it not for their self-billing as a chamber music group. Their rendition of “Faubus,” led by Pattillo’s flute and anchored by the heavy warbling of double bassist Peter Seymour and cellist Eric Stephenson, even recalls the hip-hop pedigree referenced in Pattillo’s technique, which they carried into a playful revision of that familiar theme from Beethoven’s Fifth Symphony. As can be expected, their bag of tricks is full of neat surprises, such as their half-classical, half-bluegrass interpretation of Tchaikovsky’s “Nutcracker” and the serpentine melodies of “Raga Raja,” an original piece inspired by Indian classical music, punctuated by Stephenson’s slinky portamentos. On “Slowberry Jam,” another original, Stephenson switched to finger style, whipping his bowing hand across the strings of his cello like a flamenco guitarist. 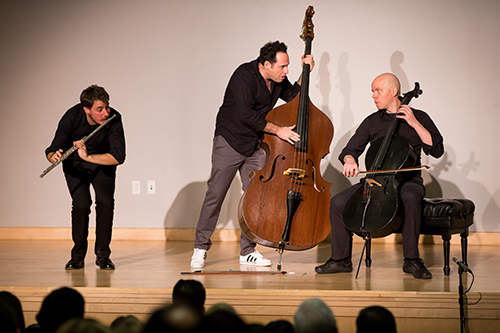 After the customary intermission, the trio introduced their unsurprisingly non-traditional take on Prokofiev’s “Peter and the Wolf,” relocating the action to a neighborhood in Brooklyn and providing their own amusing narration and unique musical signatures. Though long, the group’s keen sense of dynamics kept things fresh, and the tune didn’t overstay its welcome. PROJECT later shifted several decades forward to pay tribute to perhaps one of the first rock bands to make classical instruments cool (to the extent that progressive rock was ever considered cool), performing what Pattillo called “The PROJECT Trio version of Jethro Tull’s version of J.S. Bach’s version of ‘Bouree,’” during which the flautist stood on one leg as a shout out to Tull’s Ian Anderson. The show’s ender, appropriately titled “The Random Roads Suite,” was a sweeping summary of the band’s approach, starting with the busy and sophisticated “The Puzzle” before slowing the tempo and slightly darkening the mood for the contemplative “Adagio,” highlighted by delicate trade offs between Seymour and Stephenson. So as not to leave the crowd on a somber note, they finished with the Latin-flavored “Pelea De Gallos,” as Seymour and Stephenson again took the spotlight as the two combative chickens mentioned in the title, succeeding in bringing up both the tempo and the mood.